In this video, Ellen Mazel talks about different types of complexity — complexity of object, complexity of an array, complexity of other sensory inputs, and complexity of the human face — and the ways that we will assess complexity for children with cortical visual impairment. Understanding how each type of complexity affects your or student will really allow you to pick the correct materials, and more importantly present them in the way that the child can best access learning and social situations. MAZEL: Hi, my name's Ellen Cadigan Mazel. And I'm a teacher of students with visual impairments, a deaf-blind specialist, and a CVI advisor. Today we're going to talk about different types of complexity and the ways that we will assess complexity for children with cortical visual impairment. Using Dr. Christine Roman-Lantzy's CVI range, we look at several types of complexity. We look at complexity of object. How visually complex can an object be for a child to look at it? This tap and twirl may be too complex for a child to visually locate and understand. It has too many colors and too many shapes, and is just too complex. This disco ball, that is a solid single color, might be very easy for a child to locate in their environment and recognize. So the complexity of object is a very important thing for us to understand. Only after assessment using Christine Roman's CVI range can we decide what kinds of complexity of an object a child can tolerate. We also want to assess the complexity of an array. How many different items can a child look at and then distinguish as separate and distinct items? Here's a complex array of items. A child might be able to recognize with the slinky when it's held by itself against a non-complex background. But placed in a larger array of toys, it disappears. The child cannot recognize it in this distinct amount of a larger array. Here's a complex array of pictures. Again, a child may be able to distinguish one picture, but not distinguish it when it's shown in a larger array. Each child will have a unique number of items or unique number of pictures that they can tolerate, recognize, and distinguish when with one another. And that's part of our job, is to figure out how many is the optimal number for a child to be able to distinguish one from another. Placing this tap and twirl on a shelf increases the complexity of array. It's too many things for a child to look at. But placing that same tap and twirl on a plain background, the child can easily distinguish it from the background and it allows the child to look faster and to look longer. If I show this book to a child with cortical visual impairment, the two pictures may be too difficult for a child to distinguish one from another. Reducing the complexity by covering one picture at a time will really help children focus on that visual image separately. And again, only after assessment can we decide how many things a child can look at at one time. The third thing that we look at is the sensory inputs. Again, this means a child's trying to use their vision while they're trying to listen, while they're trying to touch a material, while they're looking at fast movement, when they have vibration, when they're being touched, or when they're trying to hold their bodies in space. All those other senses and inputs to those senses can really distract a child. So maybe that same child can take a look at this item. But when it creates noise, they immediately have to turn away. That's complexity of sound. And again, only after assessment using the CVI range can we determine how much of another sensory input a child can tolerate, and what exactly those inputs are. Maybe children can tolerate familiar noises in their environment, but with the introduction of a new sound they lose their visual abilities. The final thing we look at is the complexity of the human face. Faces really look very, very much alike, as we see in this picture. If I've taken away the salient features of hair color, shape, height, glasses, beards, our faces look very much the same. And children with cortical vision impairment have a very difficult time in all of CVI understanding and looking at faces. Certainly in phase 1, they're not even able to look at a face at all. This is one person's face. 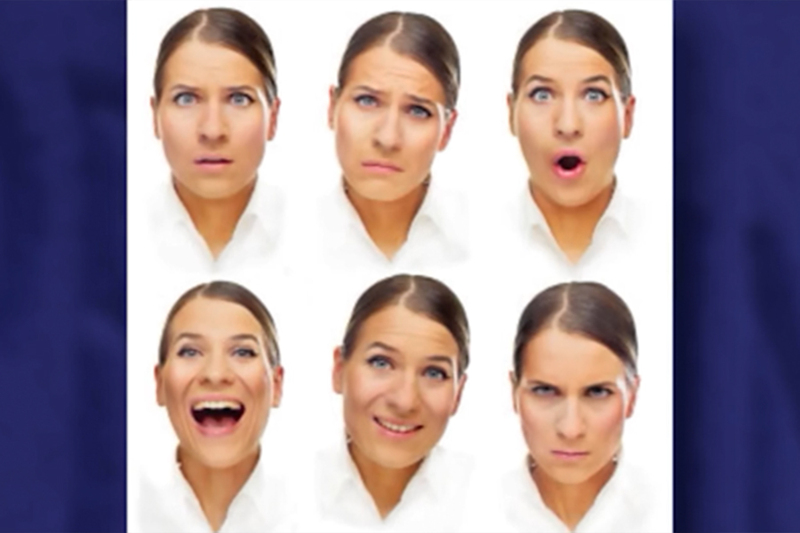 With a variety of facial expressions, this one person looks very, very different. You cannot distinguish. And a child with cortical vision impairment really struggles with this. The third example is just the positioning of a face. Faces are constantly moving. Faces are turned in different directions. And as you can see in this picture, it might be very hard to decide is this even the same person that I'm looking at? So faces are going to be something that children struggle with well into phase 3. And we have to be very careful to support their understanding of faces and their understanding of who's in the environment and what might be done with them in the environment for their social skills, certainly. And to understand this facial recognition, to understand the levels of facial complexity that a child can tolerate, we really have to assess very carefully using the CVI range. So in summary, really the difficulties with complexity that are experienced by all children with cortical visual impairment — certainly in phase 1, certainly in phase 2, and at last well into phase 3. In phase 3, we might see children having difficulty in looking at distance because of the complexity of distance, the complexity of all the other things you have to look at. They have facial recognition problems. They have problems with array. How many things can they look at at one time? And they certainly will struggle with some complexity of other sensory inputs. So understanding how each type of complexity affects your or student will really allow you to pick the correct materials, and more importantly present them in the way that the child can best access learning and social situations. Thank you very much.